If you are looking for a modern and lightweight design with an accommodation booking option for your hospitality business, Oceanica hotel WordPress theme will serve your needs perfectly. This theme is packed with all necessary functionality to run hotels, apartments, villas, vacation rental, hostels, etc. Oceanica is powered by our custom MotoPress Hotel Booking plugin for WordPress (the plugin is included for free!) that will help you add accommodations listing and enable online reservation for them without any technical help. You may easily add real-time search availability form, rates, create seasonal pricing strategy, accept online payments and let guests pay after arrival, sell extra offers, disable booking for particular dates, create discount coupons, synchronize bookings via iCal across travel agencies like Airbnb and more. You’ll have a full control over the Oceanica – add content, tweak design and automate your bookings management. The WordPress booking plugin for hotels that comes with Oceanica is professionally translated into multiple languages. It’s a fully handcrafted theme – both design and booking functionality are made by our team. You’ll enjoy how seamlessly the theme works, in visual and functional harmony. Developing Oceanica, we wanted to make it maximum lightweight, without redundant functionality. No wrong plugins, no SEO problems. Now you can manage all-in-one hotel reservation plugin, add major content and put your business online so much faster. 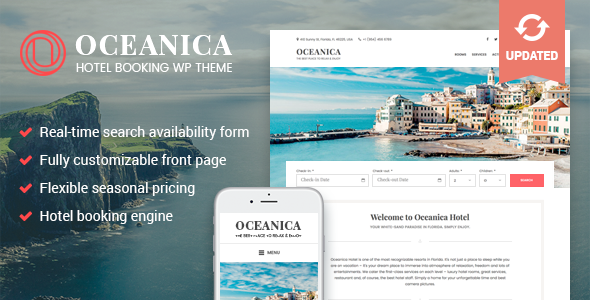 Oceanica comes with a deep native integration with WordPress functionality. It means your customization will be easier and you won’t lose your content even if you change the theme. A perfect deal for inexperienced WordPress users as well as developers. Hotel Booking plugin updated to version 2.3.1. Hotel Booking plugin updated to version 2.3.0. Added more flexible booking rules. Added support for Jetpack Content Options. Hotel Booking plugin updated to version 2.2.0. Implemented bookings synchronization with online channels via iCal interface. Hotel Booking plugin updated to version 2.1.2. Hotel Booking plugin updated to version 2.1.1. Added Shortcode Widget plugin that allows to use shortcodes in widgets. If you use Testimonials shortcode in a Text widget, please re-create it and use Shortcode Widget instead of Text widget. Improved the layout of comments on mobile devices.